The WPSL, also known as the world’s largest soccer league, sits in the second division of US soccer and features a team rallying with a community to develop the beautiful game. The Columbus Eagles, located in Columbus, Ohio, are gaining support rapidly as partners with the #SaveTheCrew movement. 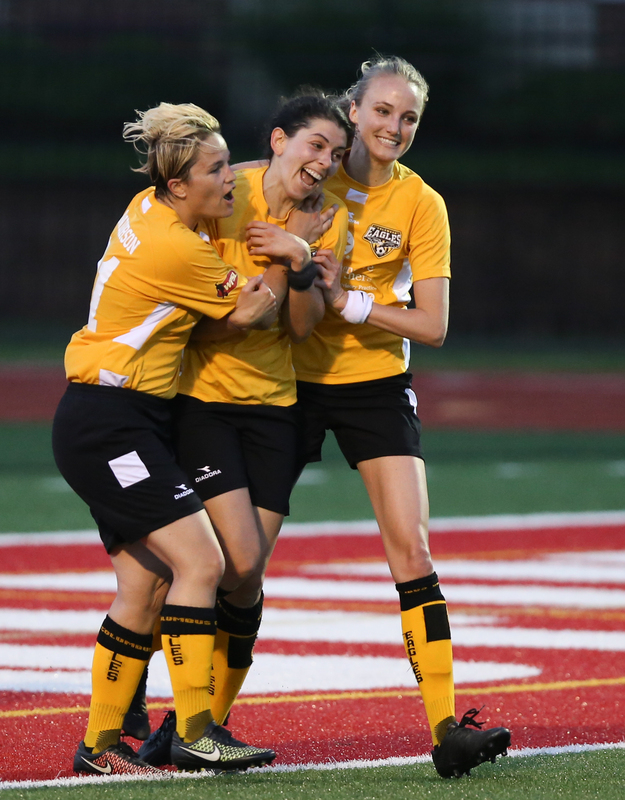 As Midfield Press expands into covering the Women’s Premier Soccer League, I had the opportunity to attend some early practices, dive into the family atmosphere the club presents, and discuss all things Columbus soccer with members of the team. I can tell you all about how the side has already set a season membership sales record, trains at a tempo that rivals those of world-class sides in Europe, or will be looking to be champions of the new ‘Valley’ division while defending their home at Otterbein University, but hearing from the club representatives themselves is more impacting. After a great conversation with Amber Kern, I sat down on the pitch with team CEO Mark Wise to delve into the conversation of team growth. Starting with the origin, I asked the founder why he decided to place a women’s team in Columbus. “Love of the Women’s game. Inspiration from Mia Hamm and the Fab Five in the 1999 World Cup and having the professional leagues pass over Columbus three times. I live in Columbus, I want to be able and go watch professional women’s soccer in Columbus then I’m going to go and try to see what I can do to make it happen.” Leading into the question on Columbus soccer fans minds’, I asked what the club’s biggest selling point was. Wise responded with an answer I can verify from what I got to see as true; “It is good soccer. I mean if you are a soccer fan, this is good soccer. Sometimes the Men’s game gets to be about power. The Women’s game is just beautiful. We’ve got some of the best women’s players in the area and if you enjoy soccer you will enjoy this.” As for those of you wanting to see good soccer but can’t locally, the Eagles CEO discussed the club streaming all matches, an asset not many second division teams across the world can offer. Wise believes this is the big breakout year for the Eagles. With a record for season member sales already, he stated “It appears to be anticipating. That anticipation is there, like going to the Crew on opening day. I don’t know what is going to be there on opening day”. As we were being told we had to leave for the facility to close for the night, I managed to ask Mark Wise for one word to describe the Columbus Eagles. Without hesitation, “Inspiration” is the word I heard. To close out the interviews, I sat down and had a terrific phone call with head coach Daniel Seiffert discussing the tactics and outlook of the team, along with getting his opinion on a couple of talking points discussed with Amber Kern and Mark Wise. Coach Seiffert is looking to bring in “soccer to be played in a beautiful way…high energy, high octane offenses that are just a joy to watch…” along with dynamic buildups. Seiffert said with confidence that his team is more prepared this season than in previous years, citing the SuperKick facility as a massive boost for training. However, a concern that I’m sure every coach will relate to is the question of team chemistry, but it is a minor concern at the end of the day. Columbus Eagles FC is a team bursting with a family feel on and off the pitch. With character near and far assisting the seemingly endless talent, this season is sure to be a success. For those of you in the area, gather your friends and family and go to Otterbein University to catch a match. For those outside the area, head over to http://www.columbuseaglesfc.com/wp/ for the latest news and video. Sit back and enjoy 2018 as Midfield Press looks to bring you the best WPSL coverage.